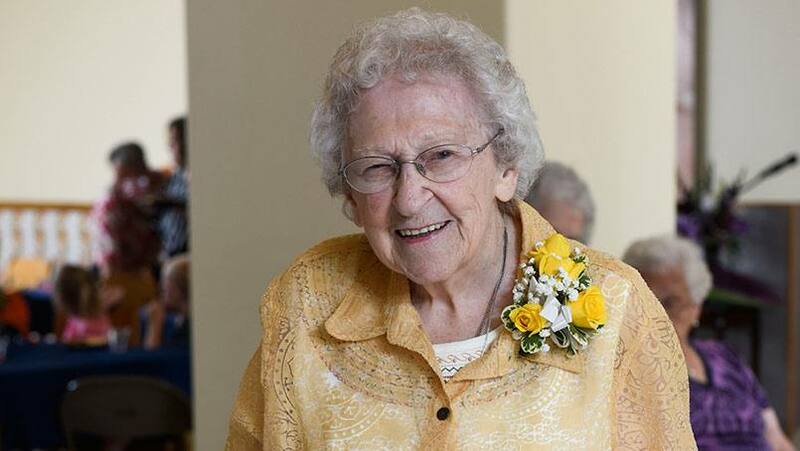 Last week, Sister Lauren Weinandt, friend of In the Loop (which we hope brings us special dispensation), turned 95. She and her fellow Sisters, along with colleagues, friends and family, gathered on Sunday, July 30, to celebrate her birthday and two other remarkable milestones. She's also celebrating 60 years as a member of the Sisters of Saint Francis and 60 years of working at Saint Marys. (She still serves as the hospital's archivist.) Sister Lauren's idea of slowing down meant moving to .8 FTE some years ago. Otherwise, it would appear she's not about to put on the brakes. At the gathering, there was a tribute, lots of history, stories shared, and cake. But Sister Lauren wanted to talk about her future goals. "I plan to wear a purple dress with a red hat that doesn't go at all," Sister Lauren began, borrowing a line from the poem "When I Am Old," by Jenny Joseph. But that's not all she has planned. I'll have my hair dyed pink, and on special occasions, I'll wear a ribbon in it. And I'll wear satin polka dot shoes with a three-inch spiked heel when I go out dancing. And when I go shopping, I'll pick up samples of food, and sit in the neighbor's swing and eat them. And while I'm at the neighbor's swing looking at the pretty flowers, I will pick some and take them home. But I know they won't believe that it was me, because everything gets blamed on that darling little innocent rabbit. Next on her list — and she says she's already tried this one — is a plan to walk into an intersection with a sign on her front and back that says "Honk if you love Jesus." In her previous attempt, she says, halfway across, "the horns were honking and honking, and pretty soon they started raising their hands out the window. First they waved, and then they got so excited they were going like this (shakes fist). I just sat there and waved." Then I'm going to try to learn how to whistle. And I'm going to go to conventions and fairs and pick up all of the freebies I can find. She closed, borrowing again from the poem, with this: "Maybe I should start practicing now, so those who know me are not too shocked and surprised when suddenly I am old and start to wear purple," she said, adding her own flourish, "My biggest worry is I hope you'll all be around to see my plans materialize." In opening comments, Sister Bernadette Novak had noted that, among other things, Sister Lauren is a prankster. Now all those in attendance can testify. Here's to many more. Make it a goal to share your comments below before you share this story with others using the handy social media tools.